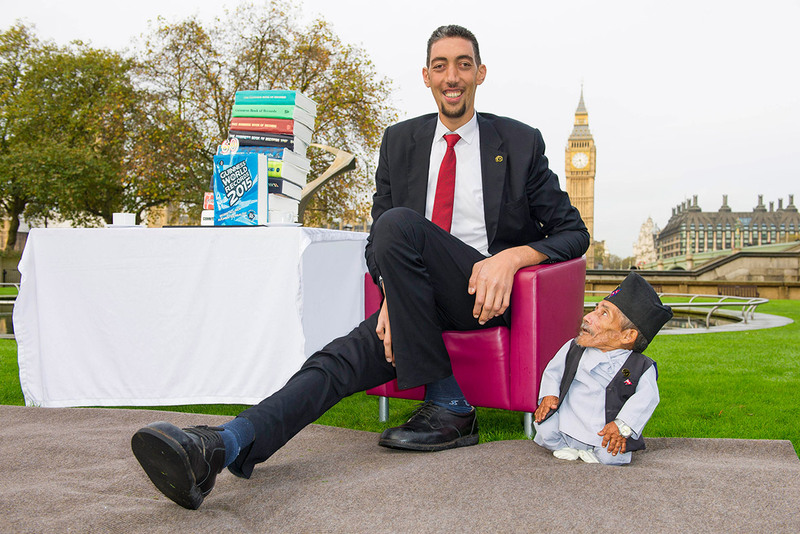 The tallest man living is Sultan Kösen (Turkey, born on10 December 1982) who measured 251 cm (8 ft 2.8 in) in Ankara, Turkey, on 08 February 2011. The part time farmer was the first man over 8 ft (2.43 m) to be measured by Guinness World Records in over 20 years. Indeed, GWR only knows of 10 confirmed or reliable cases in history of humans reaching 8 ft or more. 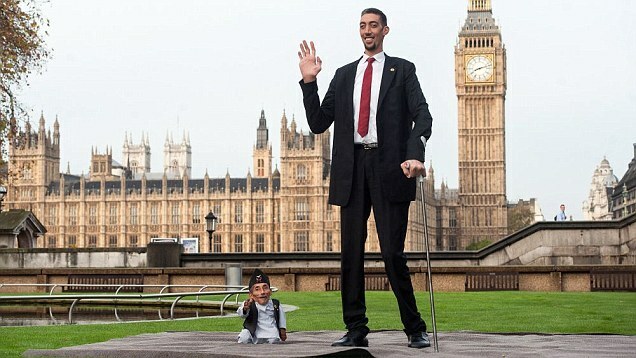 Sultan first became the world’s tallest living man in 2009, when he measured 246.5 cm (8 ft 1 in) in height. He took the title from Xi Shun (China, born on 1951), who measured 2.361 m (7 ft 8.95 in) in height when measured in 2005. “I never imagined I would be in the book, I dreamed about it, but it was still a huge surprise”. Sultan’s growth and massive height caused by a condition known as “pituitary gigantism”, which is the result of an over-production of growth hormone. Growth hormone is released from the pituitary gland in the brain; if the gland is damaged by, say, a tumour, it can release too much or too little hormone. The effects of over-production includes large hands, a thickening of the bones, and painful joints. Sultan didn’t start his incredible growth spurt until he was 10 years old. But he finally appears to have stopped growing. Revolutionary gamma-knife surgery on the tumour affecting his pituitary gland, provided by the University of Virginia, USA, in August 2010, has finally halted his production of growth hormone. Sultan is one of five siblings, with three brothers and one sister. The rest of his family, including his mum and dad, are all ‘normal’ sized. Because of his extreme height he was never able to finish school but works occasionally as a farmer to support his family. He describes one of the advantages of being tall as being able to help out his mum out with jobs such as changing a broken light bulb and hanging curtains. Disadvantages to his height he lists include not being able to find clothes or shoes that fit or finding it extremely hard to fit into a regular size car. Like every young man in their twenties, Sultan enjoys listening to music, playing computer games and watching movies. What are the giant’s dreams for the future? ” I want what everyone else wants,” says Sultan. “A wife, a family, a nice home. I’d also like the chance to find some decent clothes that fit! I’ve already had a suit made for me, and at least one dream has come true: I now own a pair of jeans made specially for me!” He concluded.